Hi. I iz Paisley! Beckett says he gets to post on Momma's blog sometimes and that if I waited until Momma left for her state CNA test - he'd share da password. Hmm... what do you want to know about me? Oh - my new nickname is Houdini! Iz so tiny that I can slip in between a gate post and the back gate. It's so funny to see Momma scream! She's buying bricks, whatever they are, after the test so that can't ever happen again. I haz an underbite. Beckett and Meadow told me I need braces. I think that Momma needz to keep the Brady boy. He's my favorite litter mate, and he snuggles almost as good as me. Beckett is the funnest to play bitey-face with. I iz his shadow. 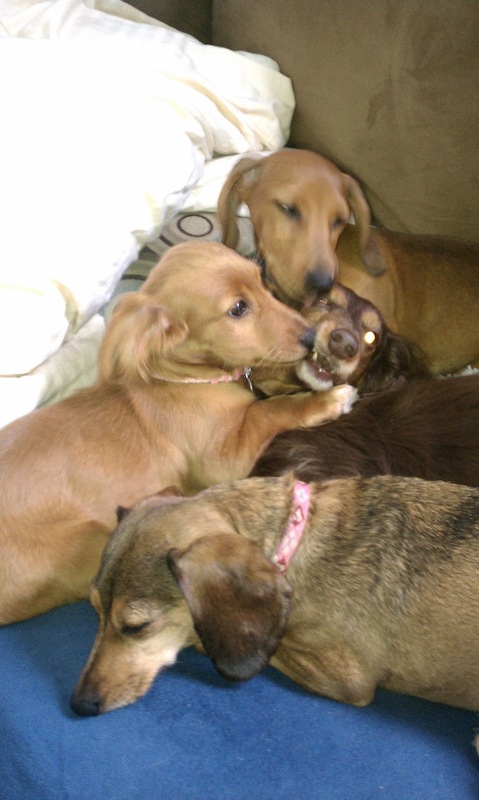 We long-haired dachshunds gotta stick together! Anything else you want to know about me? Ask, and I'll hijack da computer for a follow up post! We named one of our puppies Houdini cause she could escape out of anywhere. Do you like to dig??? Hehehehe, we has bricks too in our backyard so no buddy gets out. 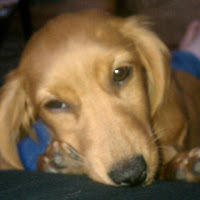 Your momma is gonna bust my chops furs dis so don't tell her...I thinks Brady ought to stay cuz dat would just be awfulls to split ya'll up and it would be good furs your momma to work on her doxie hoardin'. I is purty smart huh? Wait...my question...is you a cream? We think you are beautiful! My god Paisley is too cute! And I agree with her, you should keep the baby boy :). I LOVED having 4 in my pack, and in 8 weeks we'll be a 4 Dox pack again (if a girl's born)!!! Aw, sweet Paisley - you do need to get to keep Brady! Tell your Mama I said so!